MINIZOOM-365 comes with battery and a MAR-C0 Invisible UV blue pen. When you are in the market for a black light you want maximum effect from your UV light source. Most black light reactive materials use the long wave 365 NM wavelength. This UV light source has low apparent visible light noise. Giving the reactive surface a greater difference visually then using a higher wavelength. Now with that being said there are some materials that need 395 NM. But generally speaking the 365 NM wavelength ensures the fluorescent object, and not the surrounding surface, is illuminated perfectly such as I.D. 's and driver's licenses. The lens of the MINIZOOM-365 changes as you push it in and out. This makes the ultra violet energy focus, or if you need it, flood out an inspection area. Small enough to fit in your pocket, durable enough to last a life time. Comes with your battery so get started exploring your UV world. Black Light 365 nm Flashlight Quick Details. Type: UV black Light Flashlights perfect for ID cards and driver's license. Light Source: UV LED that kicks out some ultra violet. Battery Type: 1 xAA (included). Switch: Tail cap click switch. Black light energy is also called ultra violet light and is absorbed by the fluorescent reactive coatings emitting the glowing light. The inside of fluorescent tube lamps work the same way. Photonic energy reacts with fluorescent material and the energy is re-emitted as visible light. There are multiple types of UV energy and the most common use for our products is the 365 NM long wave type. There are countless compounds that glow under black light including minerals, plants, fungi and microbes. Other organic and inorganic substances fluoresce as well and when then do it is an amazing effect to say the least. Fluorescent materials can absorb UV radiation which is invisible to the human eye, and then emit it in the visible spectrum. The absorption of this UV energy causes electrons in the compound to jump to a higher energy levels and when they fall back, then emit a photon of light. MINIZOOM-365 Black Light UV Batteries. 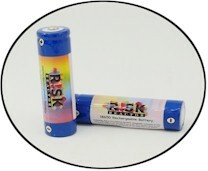 Size AA Batteries 1.5V Alkaline-Zinc.Magnanese Dioxide.